Thought I would start the blog proper with a rant. Start as I intend to continue! One of the reasons there are so many birding rather than plant blogs is, I suspect, related to the relative mobility of the subjects of interest. For most of the year, birds are mobile and exchanging information on their whereabouts offers little threat to their survival and so everyone is happy to share information with others who know full well the bird may not be present in the same place the next day. The exception is at nesting season when because of a small group of peculiar people who collect eggs, genuine birders tend to suppress information especially with regard to rarer species. With plants the situation is different, they tend to be rather sedentary organisms and once located do not tend to move too far!!!! As a result disseminating accurate information about their whereabouts means that others have a high chance of finding them. This is great for those with innocent intent to see and perhaps photograph the plants. Unfortunately there is another group of strange people who would rather translocate the plants to their own collection/garden (especially the rarer species with a high probability of dying within a season) and hence deprive everyone else of the more simple pleasures of viewing them. 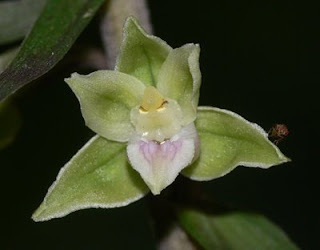 When I first got interested in wildlife over 40 years ago it was often very difficult to persuade any genuine naturalist to disclose the whereabouts of a rare plant species especially orchids. I must admit that I thought that the intervening period had resulted in a more enlightened scenario with fewer people digging up plants and locations becoming more widely broadcast. Unfortunately it seems to still be a problem. Nationally, 2008 saw at least two instances of orchid removal hitting the national press. Plants of the very rare Military Orchid (Orchis militaris) were dug up in Bucks (luckily the perpetrator was caught in the act) and plants of Dark-Red Helleborine (Epipactis atropupurea) were removed from a site in Derbyshire, Still, probably isolated instances? No, certainly not from my experience this year! 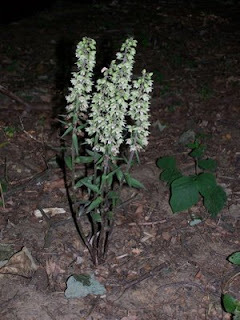 In the Banstead area we have at least one small colony of Violet Helleborine (Epipactis purpurata, left), a rather statuesque and handsome species that is characterised as it ages by developing into a clump of flowering shoots but would be easily missed by the casual observer because its true beauty is only seen close up, see below. Its preferred habitat is fairly dense shaded woodland on alkaline soils (not a habitat available in most people’s gardens) and whilst not regarded as rare is a fairly local species confined to southern England. The colony consists of about thirty plants two of which have multiple stems, one (~12 stems) grows in the middle of a footpath and is regularly trodden down but the other (in the photo) was tucked up on a bank close to a large tree trunk. I say “was” because back in July this year the half-grown plant was dug up and removed! The resulting hole was carefully filled with leaf litter. I would just like to record my personal thanks to the selfish b*****d who did it, so depriving others of the pleasure of seeing this plant in its natural habitat. Pure vandalism! If I believed that this was the action of someone who thought “Oh, there’s a pretty plant, I shall have it for my garden”, I could partially understand it, and a bit of re-education would probably prevent a recurrence. Unfortunately I suspect that the perpetrator knew exactly what they were digging up and wanted it for their “collection”, it is not a species readily available commercially. If that is the case may him/her and his/her collection rot! As a result I will not be giving any detailed references to plant sites in Banstead that I know of, a shame because I enjoy sharing my experiences of wildlife. Hi John, I was pleased to see that you have started up a botany blog, and a local one at that. Also, thanks for the mention. Would you like me to add your site to my links column? Looking forward to reading your posts, although hopefully they will not all be reporting on mindless vandalism. Well found sir! Thanks for the encouragement. Any advert would be gratefully received although I can't promise to lay off the vandals.